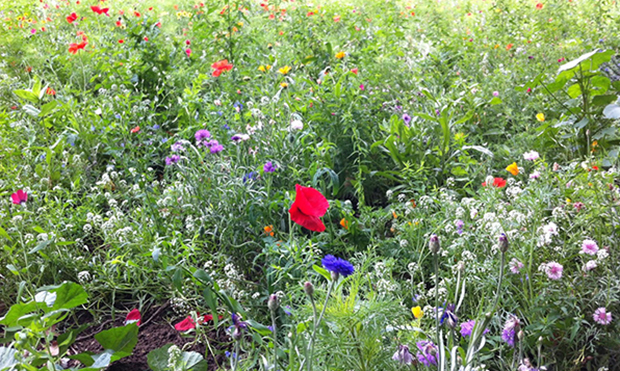 New Approach: Wildflowers blooming in London Fields. Photograph: Blood & Property. A ‘new approach’ to weedkillers linked to cancer fears is to be adopted by Hackney Council. The herbicide glyphosate is used in well-known household products around the world, including agriculture giant Monsanto’s Roundup. Now in the wake of a major US court case finding Monsanto responsible for causing the cancer of groundskeeper Dewayne Johnson, the council has announced a range of measures looking at glyphosate’s use across the borough. A council spokesperson said: “We have not stopped using glyphosate at the moment, but we are in the process of developing a new approach to glyphosate usage on Hackney’s streets. “We will only re-issue the next weed control contract for one year rather than four, while we undertake a comprehensive review of local use, emerging alternatives, and identifying new opportunities to reduce spraying. “There will be an immediate over 100km reduction on Hackney roads sprayed. This is a 20 per cent reduction on 2017, and will leading to a cut in use by about 120 litres of glyphosate a year, saving the council £10,000 per annum. The spokesperson added that the council plan to visit other London boroughs which have “wholly or largely eliminated glyphosate”. A public consultation is also planned on the development of a pilot area in Hackney where spraying will cease altogether for a set amount of time in order to assess the impact on biodiversity. However, campaigners against the use of pesticides in the borough have called for further action beyond Defra, HSE and EU directives by the council to entirely eliminate glyphosate use. Hamnett spoke out to persuade Hackney Council to stop using glyphosate in 2016, when it was revealed that 1,200 litres of the chemical was sprayed in the borough each year. She was joined in calling the council to go further on glyphosate use by Sarah Bentley, member of the Hackney Pesticide Free campaign, local mother and founder of Made In Hackney community cookery school. Bentley said: “I think the council needs to move very quickly to both protect their staff who use the product on our streets and in our parks, and also its residents. “Only the other week I saw a weed spraying truck move up the pavement mid-morning, leaving a long trail of chemical spray behind them which unknowing mums with buggies and children on scooters rolling their wheels straight into it. “Little ones are always playing with the wheels of their bikes and buggies – this will directly expose them to the toxic liquid. “It’s encouraging to see the council reviewing their practices. Knowledge evolves, especially with regards to health and environmental best practices. Bentley went on to call for a complete ban on glyphosate use near Hackney’s school and nursery grounds, as well as from parks, play parks, wild flower meadows, and recreational sports fields, as well as to limit all continuing weed spraying to the nighttime. Concerns about glyphosate have mounted since a 2015 World Health Organisation (WHO) study classified the weedkiller as “probably carcinogenic to humans”. Some “limited evidence” also suggests a link to non-Hodgkin lymphoma, the rare blood cancer suffered by Johnson. Johnson, who was awarded $239 million in the landmark case in June, now may have only months to live as a result of his condition. Cllr Jon Burke, cabinet member for energy, sustainability & community services, emphasised that, though the substance currently remains licensed as safe, the council intended to pursue a “precautionary” approach in relation to glyphosate use. Cllr Burke said: “The majority of the borough’s usage of glyphosate is for the purposes of weed removal on our streets and is part of the street cleansing operation. “As such, I have been working with council officers and external stakeholders, since I took over responsibility for this area following the May elections – prior to the most recent US court ruling on glyphosate, which I have been following with interest – to develop a new approach aimed at reducing glyphosate usage on Hackney’s streets. “With regard to glyphosate and human health, the most recent ruling in the US pertains to levels of exposure and practices that are not experienced and employed by the council, and it should be noted that the composition of Roundup, the most common commercial name for glyphosate, is composed of binding agents in the US that are banned in Europe and therefore do not feature in any spraying undertaken in the borough. “It should also be noted that the council has undertaken, under previous Mayor Jules Pipe, extensive third-party research on the use of glyphosate in the borough, which has declared it safe for use, and that it remains licensed for use in the EU and regarded as safe for use by Defra and the HSE.